You can tell this is a pen is designed and manufactured in Thônex-Genev (Switzerland). It is a very simple looking pen with clean lines. The simple look is far for being a negative statement, in fact it is the complete opposite. The look of this pen is all about the attention to the small details of the design. 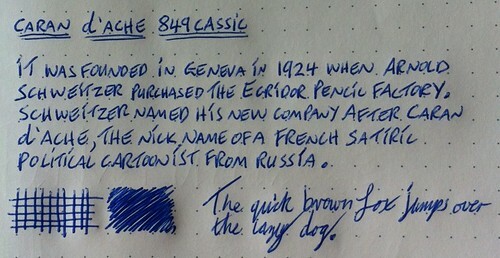 This makes the 849 Classic for me a stunning looking pen. A touch of design flair comes in the unique but strong pen clip that for some reason reminds of some sort of sight that would be attached to a gun. The barrel is made from aluminum which makes the 849 classic very durable and strong but also a very light pen to hold. To top it all off, this is a retractable pen that uses the most smoothest clicking mechanism I have come across. One light click and the nib quietly appears, another and it quietly disappears. I am really impressed with the attention to the placement of the “Swiss Made” stamp just above the clip and the model number is placed under the clip. You have to hold the pen at an angle to see this, if look at the 849 classic straight on you would never see it. It is a very light pen to hold which makes it very comfortable to hold for extended periods of writing. The weight is fairly balanced throughout but understandably due to the fact the clicker mechanism is at the top, the pen is a tad bit top heavy in weight. The 849 classic is not the longest of pens in my collection, in fact it would fall into the range of the smaller length pens. With nib retracted it comes in at 12.7cm in length. With nib produced it is 12.7cm in length. You can buy refills for the 849 classic. It uses a Caran d’Arche Goliath Refill which claims to allow for 8000 meters worth of writing. It is a medium nib but I have read that you can source finer nib sizes. I can’t really find any information about the ink other than it is marketed as a superior quality ballpoint refill. You can also buy it in the following colours: Black, Blue, Red and Green. Based of my usage of the 849 I really feel the refill lets this pen down badly. I haven’t really had much skipping issues with the ink flow (other reviewers have commented on this) but my biggest issue is with the consistency of the depth of colour. Some of my letters have this wonderful dark blue but other parts this pale blue. This happens all the time and I feel that due to the fact each refill costs £6.17 this isn’t good. Moving the above issues aside I do find that the 849 writes very smoothly. Over time one thing I did become aware of was a clicking noise while I was writing. It took a little bit of time for me to work out what was causing it but it turned out to be the nib of the refill doesn’t sit flush with the nib of the barrel. There is a super tiny gap around the rim which cause the nib of the refill to click off the nib of the barrel. After all of the above I am still unsure of how I really feel about the 849 Classic. I love the design and build quality of it but I really don’t like the refill. Another piece of information that is worth considering is the pen itself costs £12.68 and a refill roughly £6.17. Every second refill and you pretty much have spent the same as the pen actually costs. I don’t use rollerballs so maybe I have went in with the wrong expectations so if you are a big rollerball user I would love to hear from you.